This is perhaps my favorite sloka from the Bhagavad-gita As It Is. “Always think of Me”, this for me is the essence of Krsna consciousness. Srila Prabhupada once said that “Krsna consciousness is so simple, you can miss it”. Thinking of Krsna, is Krsna consciousness. 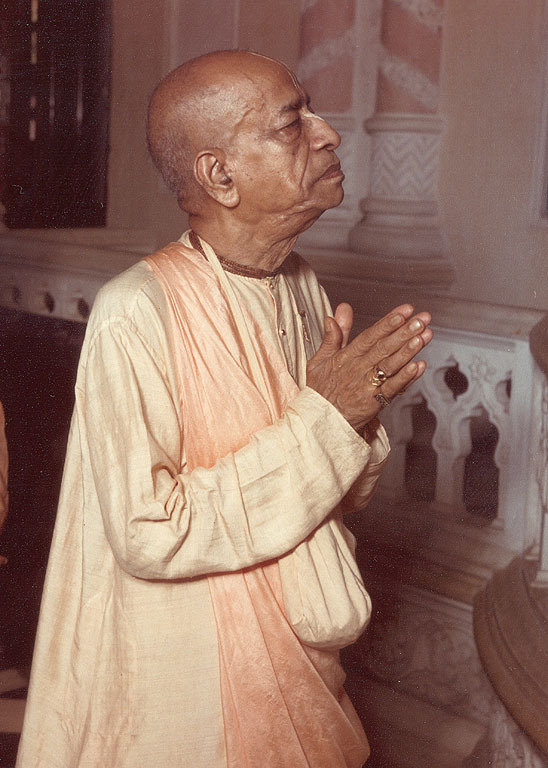 We have posted one of two lectures Srila Prabhupada gave on this very important verse. Devotee: Anyone in the rear would like to move up, you could hear much better. Prabhupāda: Come forward. Yes. And this is the process of devotional service. It is not very difficult. Everyone can execute. To think of God, to offer some obeisances to God, and to be, to serve something, to render some service unto Him, and just to become a party of God. That, just like we identify, everyone identifies to some party, either politically, socially or religiously, economically. We have got so many fields of activity. But, in each and every field, we have got a party feeling. You cannot avoid that. In political field, oh, we have got so many parties. Even in your own country, even there are democratic party or conservative party and this party, that party. Worldwide is also the capitalistic party, the communistic party. In our country also there is congress party. So party’s already there. Socially also, oh, we are Christian, I am Jew, I am Hindu. Of course, this is religiously. And socially also. In India, there is very social party. So you cannot avoid this partyism. All ladies and gentlemen who are present here, I ask you, do you not belong to any party? Can you deny that “I don’t belong to any party”? Oh, everyone belongs to some party. Now spiritualism, spiritualism means that we should identify ourself as God’s party. That’s all. That is spiritualism. They ask so many things, that, why the materialists are called crazy by the spiritualists? Oh, that is also partyism. These materialists also call, say to the spiritualists, they are crazy. Just like we are, we have formed some Society of Kṛṣṇa Consciousness, and, and those who do not like it, they say we are crazy fellows. We are assembly of crazy fellows. And, similarly, we call others who do not associate with us, they are crazy fellows. So there is, we have written pamphlet, booklet, “Who is Crazy?”. Now how to decide? You are thinking the Swamiji and the party, they are crazy. And we are thinking those who are materially engaged, they’re crazy. Now how to decide it? Can you suggest any way how to decide it, how, who is crazy? Who will decide it? Everyone, two parties, when there is something disagreement, the two parties will say that, “You are in wrong,” the other party will say, “You are…” Now who will decide it? That who is wrong? Can you suggest any one of you who’ll decide? The world is going on in partyism and each opposite party is thinking that the other party is crazy. Now who will decide who is actually crazy? The actual… Then you have come to the point of reason, who is crazy? Now just see. Take any common man. Not yourself, not myself. Any common man. If you ask him that, “What you are?”, he’ll say… His conception is that I am this body. Everyone will say. He’ll give you some description that, “I am Christian.” “I am Hindu.” “I am Mr. Such and Such.” “I am Mrs. Such and Such.” Everything, whatever he or she will say, that is all due to this body. All due to this body. Everyone. When you say, “You are American,” that means this is the body. Because by accident, by something, by some reason, you were born in this land of America. That is also another artificial name. The land is neither America nor India. The land is land. But we give some designation, “This is America.” We make some boundary. This is United States of America. This is Canada. This is Europe, and this is Asia. This is India. So this is our name, but actually was there any history that the land is American, or the land…? Say, four hundred years before, or five hundred years before, was this land was known as America? You have named it, America. Say, some thousands of years before was this, this, the continent which is known as, I mean, Europe, can you trace out history, that it was known as Europe? They are all designations. Just like we can say from historical point of view of Vedic literature, this whole world was known as Ilāvṛta-varṣa. Ilāvṛta-varṣa. And, later on, since the reign of one great king, emperor, his name was Bharata. He changed the name into his own name, Bhārata-varṣa. So this whole planet was now Bhārata-varṣa. Then, as the days go on, the some part of this world was, I mean to say, separated from the original Bhārata-varṣa, and it was called Europe or some other place. Just like you have got practical experience even in this age, that India, say about twenty years before, the area of India was including Burma, Ceylon and the modern Pakistan and everything. Now it is separated. Now they are calling this is Pakistan. Somebody’s calling there is Ceylon. So this process is going on. Actually the land is neither Bhārata-varṣa, nor Asia, nor America, nor India, but we give this name. With the change of time, with the change of influence, they are all designations. Fifty years before when some of you, of course, not all of you are fifty years old. Say, forty years before, or thirty-five years before, when you were, or twenty-five years before, when you were not born, can you say what was your designation? Were you American or Indian or Chinese or Russian, can you say? Say, after getting out of this body, do you think that you’ll continue as American or Indian or Chinese or Russian? Suppose you are now in America, in the land of America. So next life you may be in China. Who can say? Because we are changing our bodies, you cannot say that we are not changing our bodies. Can you say that you are not changing your body? Yes, we are changing. When I was born, from the mother’s womb, my body was so little. Now how I have changed my…? Where is that body? Where is that body when I was a child? Where is that body when I was a boy? Where is that body when I was a young man? I have got my photograph, my studentship. Oh, Swamiji, you were like this? Where is that body? Where it has gone? So we are changing, but I am the same man. I am thinking, “Oh, in my childhood, I was doing like this. Oh, in my youthhood, I was thinking like this. In my boyhood, I did so many things.” Now where those days gone? If my body, everything has gone away? It is simply remembrance. Everything is being conducted by the supreme laws of nature, but the foolish man thinks that I am something. I am independent. This is foolishness. Ahaṅkāra-vimūḍhātmā. Ahaṅkāra, this false egoism—ahaṅkāra means false egoism. What is that false egoism? That I am not this body, and I think I am this body. This is called false egoism. Therefore Śaṅkarācārya, I mean to say, he preached his mission that you are not this body. You are spirit soul. Ahaṁ brahmāsmi. Ahaṁ brahmāsmi. Now, still, when we try to realize ourself, self-realization, there also foolishness, or the dictation of the māyā, or illusory energy, continues. What is that? Somebody’s trying to realize his self. I am not this body. He understands that I am not this body. I am spirit soul. Then? If you are spirit soul, then what is your position? Oh, void. Impersonal. Spirit soul, that means voidness? Oh, there is nothing after finishing this body? This voidness? There are philosophers who preach voidness. After this, finishing this body, there is nothing. And other philosophers, impersonalists, they say that, as soon as this body is finished, my personal identity is finished. Do you think like that? Is it possible? So long I am in this body, this body is not actual I am. It is just like a vehicle. Just like you are sitting in a car. The car is moving according to your desire. Not that the car is moving independently. So when you are in the car, so you are moving the car according to your desire, right or left, or this road or that road. Suppose, if you are out of the car, do you think that your personality is gone? Is it any reason? So this body is just like a car. 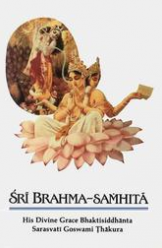 It is said in the Bhagavad-gītā, bhrāmayan sarva-bhūtāni yantrārūḍhāni māyayā [Bg. 18.61]. Māyā has placed you in this car because you wanted this sort of car. Just like you have got in your practical experience. Somebody has got better car, somebody has got, I mean to say, inferior car. Somebody has got truck. But they’re moving. Similarly, these different bodies, they are like cars, and they are moving. Now suppose you are out of the car, either from the truck or from the Rolls Royce car or Chevrolet car or Ford car, do you think that your personality is finished? Because you are out of the car? Then how can you say that when you are out of this body, your personality is finished? What is your reason? So this is another craziness. Just see how craziness follows. Void. Why void? I am so much intelligent. I am doing… I am planning so many. Because my body is finished, therefore everything becomes void? This void philosophy was contradicted by the (indistinct). There is no void. There is spirit. Now, if that spirit, when one comes to that spiritual self-realization, out of this body, then, if he’s still further advanced in spiritual knowledge, then he’ll seek what is my spiritual duty? What is my spiritual work? That is sanity. What is my spiritual work. Sanity, that is sanity. I cannot be void. I cannot lose my individuality and personality. That is nonsense. How can I? So long I am sitting in this body… Or take this same crude example. So long I am sitting on the car, I am displaying so much individuality, and so much discrimination. As soon as there is red signal, I stop my car. There is blue signal, green signal, I start my car. I’m using my consciousness. I’m working. And, simply by getting down from the car, I lose everything. I become void? What is this nonsense? No. There are six symptoms of presentation of, presence of the soul. Growth is one of the important. So growth. As soon as the soul is out of this body, no more growth. If the child comes dead, oh, there will be no growth. Oh, the parents will say it is useless. Throw it. So similarly, Lord Kṛṣṇa gave the first example to Arjuna that, “Don’t think that the spiritual spark which is within the body, due to his presence, the body is growing from childhood to boyhood, boyhood to youthhood, from youthhood to old age. So therefore, when this body becomes useless, imperceptibly, the soul gives up this body.” Vāsāṁsi jīrṇāni yathā vihāya [Bg. 2.22]. Just like we give up old dress and take another new dress, similarly, we accept another body. And we accepted another body not according to my selection. That selection depends on the law of nature. That selection depends on law of nature. You cannot say at the time of death, but you can think of. You can say that, I mean to say, individuality and that selection is all there. Yaṁ yaṁ vāpi smaran loke tyajaty ante kalevaram [Bg. 8.6]. Just, at the time of your death, your mentality, as your thoughts will develop, you’ll get the next birth according to that body. So the intelligent man, who is not crazy, he should understand that I am not this body. First thing. I am not this body. Then he’ll understand that what is his duty? Oh, as spirit soul, what is his duty? His duty is, that is stated in the Bhagavad-gītā in the last verse of the Ninth Chapter, that duty is man-manā bhava. You are thinking of something. Everyone of us, embodied, we think something. Without thinking, for a moment, you cannot stay. That is not possible. So this is the duty. You think of Kṛṣṇa. You think of Kṛṣṇa. You’ll have to think something. So what is the harm if you think of Kṛṣṇa? Kṛṣṇa has got so many activities, so many literatures, and so many things. Kṛṣṇa comes here. We have got volumes and volumes of books. If you want to think of Kṛṣṇa, we can supply you so many literatures that you cannot finish with your whole life if you twenty-four hours read. So thinking of Kṛṣṇa, there is sufficient. Think of Kṛṣṇa. Man-manā bhava. Oh, I can think of you. Just like a person who is serving some boss. Oh, he’s always thinking of that boss. Oh, I have to attend there at nine o’clock and that boss will be displeased. He’s thinking for some purpose. That sort of thinking will not do. Then therefore He says, bhava mad-bhaktaḥ. “You just think of Me with love.” When the master, when the, I mean to, when the servant thinks of the master, there is no love. He’s thinking for pound-shilling-pence. “Because, if I do not attend my office, just at nine o’clock, oh, there will be late, and I shall lose two dollars.” Therefore he’s thinking of, not of the master, he’s thinking of that pound-shilling-pence. So that sort of thinking will not save you. Therefore He says, bhava mad-bhaktaḥ. “You just become My devotee. Then your thinking of Me will be nice.” And what is that bhakti? Mad-bhaktaḥ. Devotional… Devotion means service. Mad-yājī. You render some service to the Lord. Just like we are engaged here always. Whenever you’ll come you find us engaged some duty. You see. We have manufactured some duty. Just to think of Kṛṣṇa only. Therefore what is the difference between materialism and spiritualism? The same typewriter is there. The same dictaphone is there. The same mimeograph machine is there. The same paper is there. Same, I mean, ink is there. The same hand is there. Everything is same, but everything is done for Kṛṣṇa’s account. That’s all, Kṛṣṇa’s account. This is spiritualism. Don’t think spiritualism something uncommon. You can turn the whole material world into spiritualism, if you simply become Kṛṣṇa conscious. This is spiritualism.